What exactly is Tough Cookies? We are a goal based meal delivery and subscription service based in Massachusetts passionate about nutrition and high quality food. 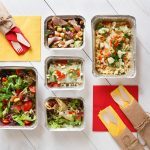 We deliver fresh (not frozen) prepared meals, developed by our team and nutritionist. They’re fully cooked so all you have to do is heat them up. No shopping, no cooking, no cleaning. But also no artificial ingredients, preservatives or added sugars. Tough Cookies is dedicated to preparing great tasting meals that consist of the highest quality ingredients to help you achieve your goals. Where is Tough Cookies currently doing business? We deliver all throughout the Greater Boston Area. We currently serve up to a 30 mile radius from our kitchen, located in Rockland, MA. 1. First, you pick your plan. Select from three different plans, Weight Loss, Balance, or Gain Muscle. Choose the amount of meals per week. You can change up your number of meals with every order if you’d like. 2. We’ll deliver it fresh. We send your weekly meals to your door on Sunday’s. You don’t have to be home to receive your meals. 3. Just heat and eat. Then repeat. Your meals can be heated in the microwave in 3 minutes. You can rate your meals when you’re done so we can keep developing meals you love. When can I expect my meals to arrive? All orders are made on Saturday and delivered on Sunday. Orders for Sunday delivery are accepted daily until Thursday at noon (12PM). First time customer orders are due on Wednesday at Midnight. We deliver on Sunday between 9am-6pm. Don’t see your area listed don’t worry! Please email us and let us know where you live and we will see how we can best serve you! Does Tough Cookies have a pick up location? If you would like to pick up your food on Sunday’s at 83 E Water St, Rockland, MA 02370. Leave “Pickup” in order notes and we will contact you about a pickup time. Yes, our minimum order is 4 meals per week. Delivery is FREE. Can I modify my plan or skip weeks? To change meals, or adjust the amount of meals you receive, visit the Upcoming Deliveries page. You can skip and unskip weeks as you like, and you won’t be charged for the weeks you’ve skipped. Changes to your delivery must be made by noon every Thursday. To change your plan details, visit your Account settings page. We understand things come up, so we make it easy to skip weeks in your subscription up to four weeks in advance! Once you’re signed in, simply head over to your Upcoming Deliveries page and scroll down to the delivery you want to skip, and click the “Manage week” and then “Skip Week” button. If you decide you’d like to cancel your subscription, once you’re signed in, head over to your Account Settings, in the navigation you’ll see a "Cancel Subscription" link at the bottom of the page. When you click on it, we’ll ask you a couple questions about why you’re canceling and then you’ll be all set. 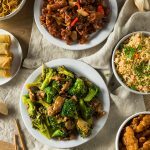 How do I change my meals for an upcoming delivery? You’ll see a pre-selected menu based on your meal history, dietary preferences, and any updates to our menu (like new or removed meals). As long as you’re making changes before your deadline, you’ll see a "Change meals" button underneath the currently selected meals—that’s where you can add and remove meals. Select “Manage Week” under the order you want to edit, and use the slider to select which days you will be eating your meals. Select the amount of meals per day you would like to recieve for that week’s delivery. Whatever number you choose will only update for that week, not for all future orders. Head to your Account Settings. From here you can make changes to your plan. You can select from Weight loss, Balance, or Gain muscle plans. Changing your plan will clear your selected meals on Upcoming page and change your meal selection. You can also use the slider to select which days you will be eating your meals and the meals per day buttons to adjust the amount of meals you receive per week. Welcome back! Ready to pick up where you left off? First, sign in and you’ll see a "Reactivate" button. Once you’ve reactivated, we’ll auto-populate your upcoming orders so you can start planning your meals. Our meals are sealed and maintain freshness in the refrigerator for up to 5-7 days. We suggest freezing our meals if you would like to make them last longer. If you freeze them, you can simply defrost them in an oven or microwave before consumption. For an additional fee, we can modify any plan to be fully gluten free, dairy free, or Both! We take measures to handle food allergies separately than other meals. Note: our ingredients are handled in facilities that process milk, eggs, fish, crustacean shellfish, tree nuts, peanuts, wheat, soy, gluten, and sulfites. No, all meals are made to order and with fresh ingredients. Do you have a meal plan with calorie count or macros included? Yes, we provide calorie counts and macros for all meals. Nutritional information can be found on the Weekly Menus page when you click into each meal. Our culinary team uses a nationally recognized database to calculate the nutrition profile for each ingredient as prepared according to our recipe.